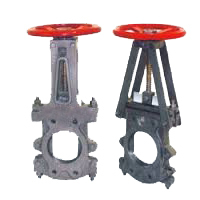 S J ENGINEERS offers Pulp Valves (Plate Valves) which are carefully designed to cater unrestricted smooth flow of viscous Fluids. Recess free straight passage orifice offers minimum body contact of line fluid, Avoids accumulation of viscous fluid in the orifice ensures unaltered velocity. Our Valves are widely used in Sugar Industries for handling Molasses, Isolation of Pulp & and Fibrous Material in Paper Industries. It is Ideally suitable for Hopper Isolation in the Cement Industries, for corrosive Slurries in the Chemical Industries, Powder Application Minerals & Metal Industries, Coal Ash with abrasive Particle in the Coal & Mining Industries. - BODY MATERIAL : CAST IRON, CARBON STEEL ( ASTM A 216 GR. WCB ), CF 8 ( SS 304 ) , CF 8M ( SS 316 ) & OTHERS. - END CONNECTION : FLANGED ENDS TO ANSI B 16.5 , BS 10 TABLE D,E,F,H. - PRESSURE RATING CLASS : ASA 150.